An older woman is having painted the façade of her lovely early 20th century place in Melbourne's inner-city suburb of Collingwood. A neighbour, wearing kooky glasses and highlighted hair, stops for a chat: 'You're making me feel guilty about not doing anything to my place!' she says. Then they small-talk about how they ought never buy vegetables from the supermarket, but that there are some lovely, if a little pricey, veggies in Clifton Hill. Such is the friendly banality of home ownership in a rapidly gentrifying suburb of Melbourne. These are just regular middle-class people living their lives. Sometimes in neighbourhoods like these, though, it's hard to remember that their popularity for homebuyers has stemmed from the grit of their radical and disadvantaged histories. Next door, they haven't forgotten. A handful of people — neither renters nor homeowners — are doing some sprucing of their own, and it's not to do with organic veggies. This collective of housing activists, of all ages and backgrounds, is doing the labour of holding the state government accountable. 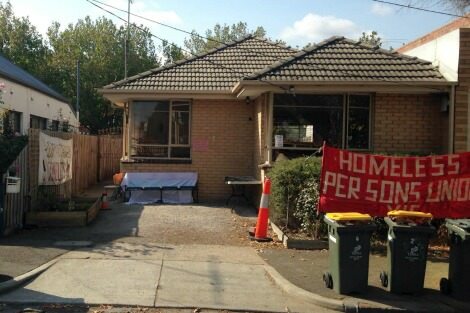 Some of Victoria's at least 22,000 homeless people and their allies, collecting under the auspices of the Homeless Peoples Union, are squatting in two state-acquired houses to draw attention to the Victorian state government's mismanagement and silencing of the public housing crisis. Eighteen months ago, 17 houses on and around Collingwood's Bendigo Street were attained by the Department of Economic Development, Jobs, Transport and Resources to make way for the now-defunct East-West link tollway. Until the Homeless Peoples Union began their occupation, seven homes on the 'ghost street' sat empty. "Part of the squatters' work is pressuring the government to account for these homes — to articulate how many there are and what is planned for them — which it has so far avoided doing publicly." More simple, perhaps, knowing that there are currently 33,000 people awaiting public housing in the state, many of whom are scratched from the list only when they die. And yet more stinging: 30 per cent of homeless were born overseas, pointing to a culmination of disadvantage facing racialised people in Australia; and more than 20 per cent are first nations people, living homeless in their ancestral lands. According to the research the union has undertaken, there are at least 37 habitable houses from the acquisitions that are currently empty, and which, at present, serve no immediate or known function. Part of the squatters' work is pressuring the government to account for these homes — to articulate how many there are and what is planned for them — which it has so far avoided doing publicly. Meanwhile there are in the region of 80,000 unoccupied dwellings in the state, most of them privately owned, being kept unoccupied to accrue value in a time of supposed scarcity. A report published by lobby group Prosper Australia found that of these, almost 20 per cent were investment properties. Author Karl Fitzgerald said that the report showed 'clear evidence [that] land is being hoarded for profit. Up to 18.9 per cent of all investment properties lie empty.' Having analysed eight years' worth of data, he concluded that this 'hoarding is magnified in periods of increased speculation'. And while these homes are being hoarded to accrue value, between 50 and 60 per cent of the finite resource of freestanding houses in areas amenable to young families are currently occupied by singles and couples in their 50s or older, pushing young families who will not presumably benefit from this class's wealth, to live in regions without adequate access to transport, education, and other amenities. With an aging population, this number is set to grow. When we talk about the 'housing crisis' we are often colloquially referring to the plight of young working people and migrants struggling to tap into a property market that has been made a prestige market. This has been incentivised by tax breaks for investors, and likewise it is symptomatic of the culture of hoarding family wealth for the purpose of passing down class privilege (and with it, class disadvantage). What the Bendigo Street occupation reminds us is that the 'housing crisis' is part of a bigger problem; it is one and the same as the homelessness crisis. And the homelessness crisis is not one of scarcity, it is one of policy. It is a crisis of an economic culture that devalues the lives of those outside the margins. Ellena Savage is the Editor at The Lifted Brow, commissioning Editor at Spook Magazine, and a graduate student in creative writing. Recent articles by Ellena Savage. Shelter is a basic human need. Having a stable home enables people to develop a life beyond mere survival. Ensuring that everybody has a home is a basic public good that government needs to oversee. The alternative is a fractured and dangerous society which is what we are seeing. People cry out for tougher sentencing when they should be marching in the streets for better services for those being left behind in a system that is riven with unfairness. Freestanding houses occupied by '...couples in their 50s or older...' As I've pointed out before on this site, many people in their fifties still have children just leaving primary school. (Mothers of first children are often forty years old or more now.) The scourge of homelessness is not fixed by targeting people above the age of 50. Look at things such as negative gearing, and, most importantly, the general idiotic claim that there's not enough money for public housing while there is still massive tax avoidance going on unchecked. What does $20 billion worth of subs look like anyway? What is the biggest number you can visualise? You can probably picture a crowd of 100,000, either because you were once part of such a crowd or have seen shots of a full MCG on Grand Final day. But what about ten times as many, or 1000 times ten times? Now we are talking billions, and your mind has likely gone into what computer programmers call overflow. So when we read that the cost of replacing our six subs with 12 new ones will be $20 billion, it means little to us: it's just a number. Last week, a member of Parliament, Jenny Leong, allegedly faced racist and sexist abuse by police from at least four separate commands. This abuse was linked to her opposition (in accordance with her party's stated policy) to the use of drug sniffer dogs without a search warrant. Whether or not one agrees with Green party policy in this regard, the treatment of Leong ought to rankle. Such ill-treatment at the hands of the executive is, unfortunately, not an isolated phenomenon.